President-elect Donald Trump says he plans to nominate Georgia Representative Tom Price, an ardent critic of Obamacare, to head the Department of Health and Human Services. In a statement early Tuesday, Trump called Price "exceptionally qualified to shepherd our commitment to repeal and replace Obamacare and bring affordable and accessible healthcare to every American." Trump also named Seema Verma, a health care consultant who designed Indiana's Medicaid program, as the administrator for the Centers for Medicare and Medicaid Services. The agency administers Obamacare. One of Price's top priorities as health secretary will be to dismantle the sweeping health reform law that his two predecessors spent six years implementing. "There is much work to be done to ensure we have a healthcare system that works for patients, families, and doctors," Price, an orthopedic surgeon, said in the statement. Price, who chairs the House Budget Committee, has long decried Obamacare as a threat to quality and affordable health care. "The purpose of health reform should be to advance accessibility, affordability, quality, responsiveness, and innovation," the Republican congressman said in 2011, a year after Obamacare was signed into law. "None of these are improved" by the Affordable Care Act, he added. The nomination is subject to confirmation by the Senate. Democrats were quick to attack it. "Congressman Price has proven to be far out of the mainstream of what Americans want when it comes to Medicare, the Affordable Care Act, and Planned Parenthood," said Senator Charles Schumer of New York, the incoming Democratic leader in the Senate. "Thanks to those three programs, millions of American seniors, families, people with disabilities and women have access to quality, affordable health care. Nominating Congressman Price to be the HHS secretary is akin to asking the fox to guard the hen house." Price then spent four terms in the Georgia State Senate. In 2004, he was elected to the House of Representatives. He was named Budget Committee chair in 2015. Price has authored several iterations of an Obamacare replacement plan, which bears many similarities to Trump's vision for health care reform and to House Speaker Paul Ryan's overhaul proposal. Price's most recent bill, The Empowering Patients First Act of 2015, calls for giving refundable tax credits to those who buy policies in the individual market. The credits would be adjusted by age, ranging from $1,200 for those age 18 to 35 to $3,000 for those age 50 and up. The plan would also offer more incentives for Americans to use Health Savings Accounts, including a one-time $1,000 tax credit for making contributions. It caps the tax exclusion on employer-sponsored plans at $20,000 for family coverage, and it allows insurers to sell coverage across state lines. Price's bill also pushes states to create high-risk pools to insure those rejected by carriers on the individual market -- usually those who have costly, pre-existing conditions. Also, it limits using federal funds to pay for abortions and protects health care providers who don't want to perform abortions for religious reasons. More recently, Price has touted Ryan's health care plan, titled "A Better Way." 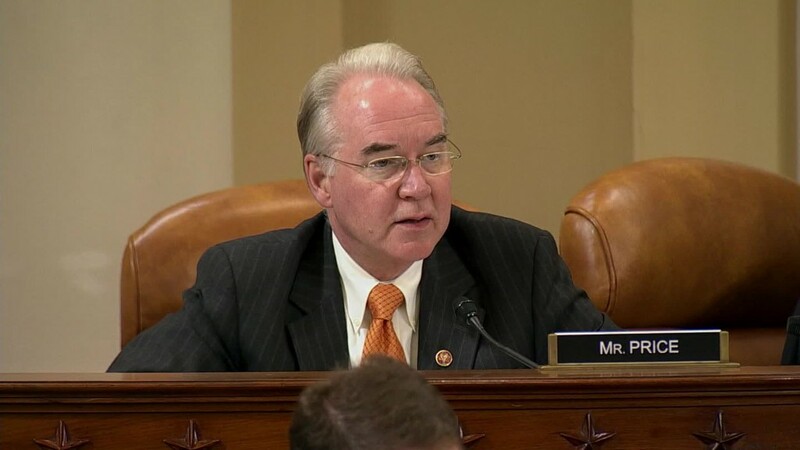 "It's time for a better way to put patients, families, and doctors back in charge of medical decisions," Price said in October. "President Obama and Democrats must put their pride and politics aside so that we can start over with a Better Way—a step-by-step plan to give every American access to quality, affordable health care." Ryan called Price "the absolute perfect choice." "As a legislator, he has played a leading role in developing conservative health care solutions that put patients first," the House speaker said in a statement. Price also supports using the budget reconciliation process -- which allows Congress to approve provisions that affect federal revenues and spending with a simple majority instead of 60 votes -- to overhaul health care and entitlements, including Medicare, in 2017. As Health Secretary, Price also would oversee Medicare, which provides health insurance to more than 57 million senior citizens and disabled Americans. Ryan's "A Better Way" plan calls for giving enrollees premium support payments, or subsidies, to cover or offset the cost of their Medicare premiums. Critics are concerned that this would leave Medicare participants footing more of the bill. Verma is the founder of SVC, a health policy consulting company. She was worked with governors and states on Medicaid, insurance and public health projects for more than 20 years. She led Indiana's health reform effort under former Governor Mitch Daniels. In announcing Verma, Trump noted that she has had "extensive experience redesigning Medicaid programs in several states." She served as the architect of Indiana's Medicaid program and its expansion effort under Governor Mike Pence, who is the vice president-elect. Pence agreed to expand Medicaid and even offer participants the option of limited dental and vision benefits. But, in return, enrollees must make monthly contributions of 2% of their annual household income to an account similar to a health savings account. Hoosiers who elect basic Medicaid coverage face co-pays, which could range from $4 to $8 per doctor visit or prescription and could run as high as $75 for each hospital stay. Trump will likely lean heavily on his health secretary to replace Obamacare. "This pick is quite consistent with President-Elect Trump's commitment to repeal the Affordable Care Act," said Larry Levitt, senior vice president at the Kaiser Family Foundation. "Tom Price has been a consistent foe of the ACA. And he knows the ins and outs of how Congress works, which could prove important as we enter another big legislative debate over the future of health care." The president-elect has promised to repeal Obamacare as one of his first acts after taking office on January 20, but he has yet to lay out a detailed plan on how he'd replace it. --CNN Correspondent Phil Mattingly contributed to this story.